Warfare can take many guises, and not all of them need to be abundantly destructive. Now, thanks to Boeing, a new electromagnetic pulse weapon will provide our military with the capacity to turn an enemy's lights out, rather than knocking their lights out. Darkness falls: a new CHAMP missile strikes the grid. According to digitaltrends.com, this new missile is capable of detecting and eradicating enemy electrical systems without brutal collaborative damage (a.k.a. bombing something to rubble.) Its design was intended to exert a comparable level of force to a nuclear blast, but without the associated death, radiation poisoning, and other infrastructural and interpersonal mayhem. 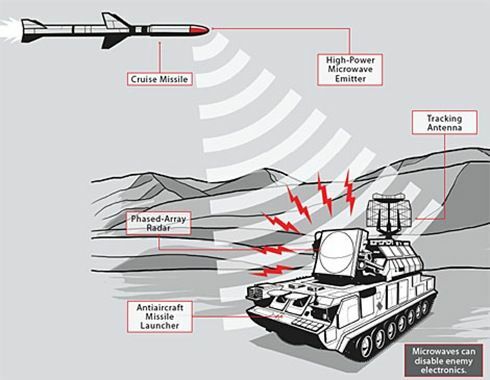 Referred to as “CHAMP,” or Counter-electronics High-powered Microwave Advanced Missile Project, the system blasts high-powered electromagnetic pulses at targets, blacking out buildings and scrambling the electrical systems therein. The particular precision of being able to target enemy buildings alone (as opposed to an entire city) makes the weapon especially effective for operations in busy urban environments. It's not just for cities, either: CHAMP can fry electronics anytime, anywhere. The project has been underway for several years now, with reports from 2012 revealing that CHAMP was able to successfully eradicate seven targets over the course of one mission in Utah. Now, in the words of Air Force Research Laboratory commander Major General Tom Masiello, CHAMP is “an operational system already in our tactical air force.” Five of the CHAMP team are known to exist, with the likelihood of more in development. With the advent of laser weapons also becoming a tactical reality, it is nice to see that although warfare will likely never cease, at least now we have better means of targeting those we need to remove. The innocent, no matter how geographically-unfortunate, should not have to suffer for others' crimes. Then, after CHAMP hits, we send in these guys to finish the job.